You can’t live on land like this, expect to farm it, and not have a tractor. Mind you, we tried. An old gas push mower cleared the long grass around the house and even cut paths into the brush. We nicknamed him The General… nothing is too much for him. Last summer Rick used The General to mow a kilometre- long path to the blackberry patch. Uphill. More than once. And our family vehicle may have leather seats, but its most valuable asset is the trailer hitch and a V-6 engine. You haven’t lived on the edge until you’ve watched your husband force a boulder out of the Canadian Shield. It takes hours. A good crowbar. And cold beer. More for me than him. Tilling, moving boulders, clearing bush… 300 acres is work. So we started our search. New tractors are expensive. It wasn’t looking promising. That’s when Prime Minister Stephen Harper stepped in. Let me rephrase that: I have a lot of respect for the political process and for many of the people who spend their careers trying to make it work. And I have spent decades up close. As a journalist on Parliament Hill and as a parliamentary press secretary. So in March, when it looked like the Prime Minister was going to the polls, I got a call from the Canadian Parliamentary Affairs Channel. Would I do a series of half hour television profiles on hotly contested ridings? The pay was decent. We needed a tractor. Long hours. But I’d get to meet, interview and write about Canadians who believe in Canada so much that they want to be Members of Parliament. I’d be five weeks on the road. Hotels have bathtubs. South Road Farm does not have a bathtub. So much got put on hold for those five weeks. But we made it through. Here she is. A Case 680D. We’ve called her Cassie. She needs a bit of work. But she has a bush hog, a tiller, a log splitter and a three point hitch. Trust me, that’s important. Now we just have to finish the barn so she has a place to stay out of the weather. And The General will always have a warm, dry spot in there too. This entry was posted in Uncategorized and tagged canadian politics, south road, stephen harper. Bookmark the permalink. Wow, now that’s a beauty! Gail I always love your stories. I wish you would write a novel. just a bit longer nikki.. and we will be ready for you to come up and look for harry, meet the fox, and enjoy the good stuff that will come out of the garden.. ! At least one good thing came out of the election then eh Gail, looks like fun. 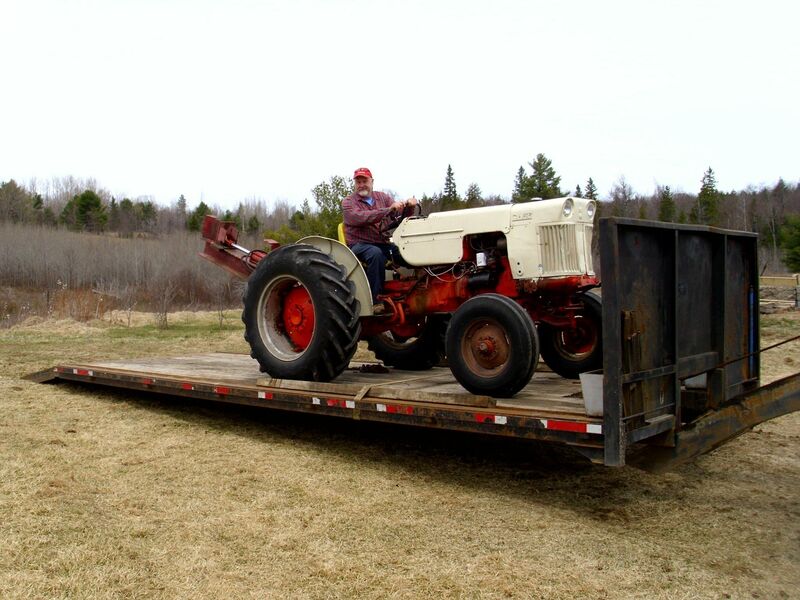 Bet you never imagined you’d emerge from retirement for a tractor with a three-point hitch, eh? Also – look at Rick! Most of us would look like city folk pretending to be country folk if we were to sit on a tractor, but Rick looks like real, honest-to-goodness, salt-of-the-earth country folk! i don’t think he has ever been happier in his life. he works harder than anyone i have ever known and thinks it is fun! Plants, Pickles and Pink Vinegar.